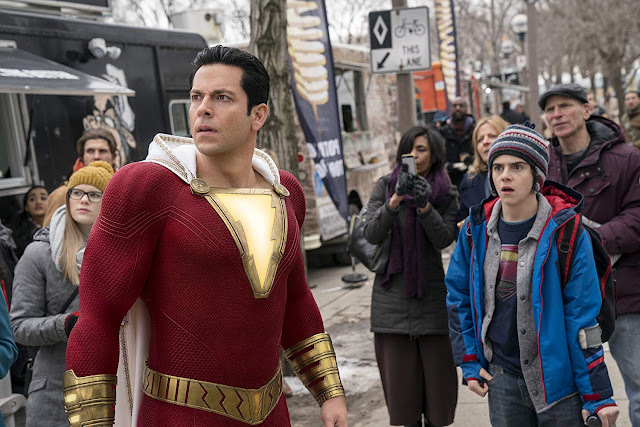 Shazam (zachary Levi) consults with Freddy (Jack Dylan Grazer) before jumping into action. As was mentioned, Sandberg's Shazam! opens in 1974 with a young Thaddeus Sivana (Ethan Pugiotto) as he is transported to a magical hidden temple in another, secret dimension. 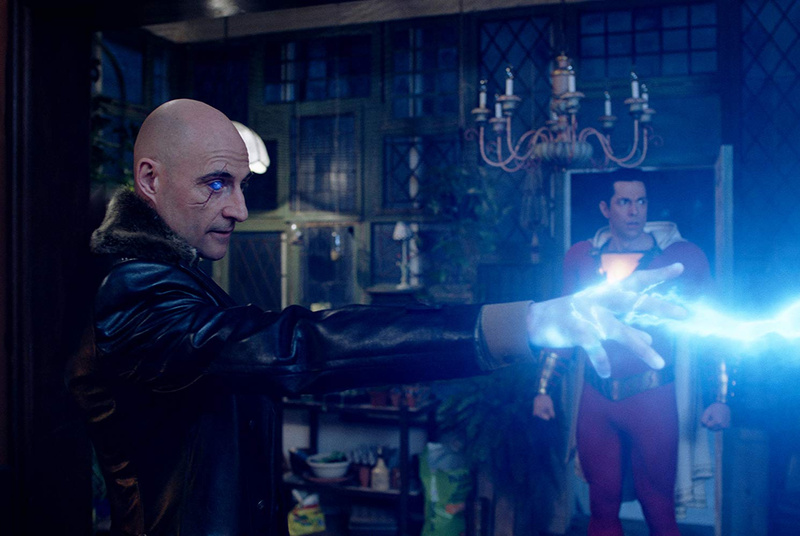 There, Sivana meets an ancient wizard who calls himself Shazam (Djimon Hounsou) and is the last remaining member of a Council of Seven Wizards who has spent centuries searching for a new champion that is "pure of heart". The set-up is that a previous champion went mad and released the Seven Deadly Sins upon the world which in turn the wizards confined to stone statues that now line the halls of this separate dimension where their temple exists. Young Thaddeus is tempted by the Sins and is therefore deemed unworthy or not "pure of heart" and then sent back to his own reality with the knowledge that a magical hidden temple of wizards somehow actually exists out there and that he almost had the chance to be a part of it driving him crazy to the point that he pursues locating this newly discovered dimension into his adulthood-essentially making it his life's mission. This is where the film fast-forwards to present day Philadelphia where we are introduced to fifteen-year-old Billy Batson (Asher Angel of the Disney Channel's Andi Mack) who is a runaway foster kid scamming police officers for no more malicious a reason than to use their computers to track down his birth mother's location. After running away from so many homes in only so much time, the State places Billy in a group home run by Victor (The Walking Dead's Cooper Andrews) and Rosa Vazquez (Marta Milans of HBO's High Maintenance) with five other foster kids; Mary Bromfield (Grace Fulton), Pedro Peña (Jovan Armand), Eugene Choi (Ian Chen), Darla Dudley (the scene-stealing Faithe Herman), and Billy's new roommate and superhero enthusiast, Freddy Freeman (IT's Jack Dylan Grazer). Though Billy's first instinct is to once again flee the foster home no matter how welcoming, Billy is admittedly pulled into the warmth of the family dynamic-even if it's against his will-as proven by the fact he finds the urge to defend the crippled Freddy when bullies pick on him at school. This act of courage and honor leads Billy to be transported to that same temple the young Sivana had been some forty-five years prior where he discovers Shazam has chosen him as this new champion. By calling Shazam's name, Billy is transformed into an adult superhero now endowed with all of the wizard's powers including super-strength, super-speed, bullet immunity, lightning manipulation, and of course...the name. Enhancing this experience even more is the other side of the coin on which Strong's Sivana exists as Zachary Levi's adult version of Billy looks the part of this full-on super hero, but whose performance is required to maintain the innocence and attitude of a teenager who is both a little freaked out by what is happening while inevitably getting ahead of himself after learning more about the extent of his abilities. Though recognizable in its dorkiness and acknowledging in its corniness, Sandberg is somehow able to reign in the tone of his film and keep it in check as Levi elevates the material in general by being all-around delightful in the type of casting that will have the likes of Hugh Jackman and Robert Downey Jr. looking your way. Levi, tasked with this endeavor of playing a fifteen year-old trapped in a super hero persona who has to figure out not only managing these new powers, but this personal life that is in turmoil due to a well-tracked arc concerning the foster element of the story and the tracking down of Billy's biological mother, gives the actor an opportunity to not simply play into the comedy found in playing up the tropes expected of a super hero, but of highlighting the crisis of conscious this kid has in discovering everything isn't black and white as we see so many instances of innocence bleed into experience through the conflicts Billy encounters here. These new abilities Billy has acquired initially allow the character a reprieve from the weight of his personal burden only for him to eventually realize the responsibility that comes along with such responsibility is not an easily excused one. Angel, as the teenage version, shares enough similarities with Levi for the transition to be convincing enough, but what is more important is both actor's ability to convey this genuine sense of excellence in this guy even when he does things we know he knows are the wrong things to do; that is to say these characters make mistakes, but are never doubted as good people as it's clear these are little more than rash desires of impulses that lead to such decisions and not simply his nature. This is saying a lot for what boils down to a corny super hero movie because this level of sincerity lends the silly and sometimes scary tone of the film real heart and heart was always going to be the key ingredient if this was going to work at all. In the end, Shazam himself, Billy Batson, learns how to be a super hero because he finds the right place for his heart to feel at peace in-where it is welcomed and where he is in service to those who aren't as entitled as him-a feeling he is only recently been acquainted with. Dr. Sivana (Mark Strong) demonstrates his own set of skills in Shazam! Complimenting this titular character, but dual performances of Angel and Levi is that of Grazer's Freddy who has to bounce back and forth between each of these individuals while maintaining the same rapport with both of them so as to allow the audience to believe this is still the same person on the inside even if the relationship between them is slowly changing and adapting to all of these shifts in each of their respective worlds. To seamlessly accomplish this is one of those things that might not initially be considered even by Grazer or his co-stars, but this potential challenge is made all the more invisible by Grazer's performance as he is so naturally funny and charismatic that any such difficulties don't exist. It is in speaking to such complications rendered ineffective that one truly speaks to Shazam! as a whole given the film could have very easily been an experiment gone awry for DC. It is to Sandberg and Gayden's credit though that not only does Shazam! 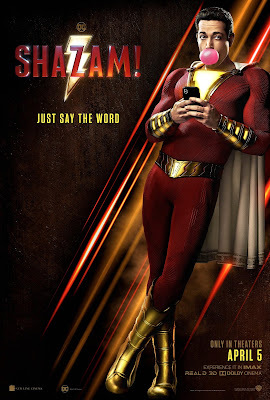 not fall into the trap of becoming just a "light-hearted" comic book flick or just a kind of meta-commentary on the genre through the comedy of the piece-both of which Shazam! does effectively-but that the film excels past those identifiers to become a living, breathing, organism of a movie that has full arcs for each of its main players (though some of the united nation of supporting children are underdeveloped) and forcing the narrative to ride on the back of these character motivations ultimately leading to conflict that would naturally arise out of the experiences we see our players confront. Furthermore, composer Benjamin Wallfisch is to be commended as well as he lends these proceedings that true "Amblin" sense with a score that hearkens back to the Burton Batman films as scored by Danny Elfman with just enough wonder infused into the bleakness to make the music more than just an homage. What also helps Shazam! apart from its fellow DC film adaptations specifically is the way Sandberg handles his big set pieces. While even a solid film like Wonder Woman was brought down by its over-reliance on CGI in the third act battle, Shazam! takes this mandatory piece of the pie as a way to make an out and out grand reveal as well undercut some of the grandiose with more of its keen and cutting commentary. Both this final battle and a sequence with a bus are fantastically executed as both stand to not only display peril and how our hero is necessary in such situations, but also continuously build on the story and characters that are actively participating in them. That along the way, Grazer provides some hilarious comic relief, Strong and his legion of deadly sins up the ante on evil, and the mixture of Angel and Levi levy the ridiculous amount of heart the film possesses against the other elements is nothing short of the cape to one's super hero ensemble.